(Collector's Edition) 2017 $69.99 ? (Collector's Edition) 2017 €89.99 ? (Collector's Edition) 2017 £79.99 ? (Collector's Edition) Summer 2017 $69.99 ? (Collector's Edition) Summer 2017 €89.99 ? (Collector's Edition) Summer 2017 £79.99 ? JP 2017-08-16 ¥1,800 (1,944) ? Sonic Mania (ソニックマニア) is a 2D platformer developed by Christian Whitehead, Headcannon and PagodaWest Games. The game is a return to the style of the Mega Drive games, and features both brand new zones as well as re-imagined zones from Sonic the Hedgehog, Sonic the Hedgehog 2, Sonic CD and Sonic 3 & Knuckles. 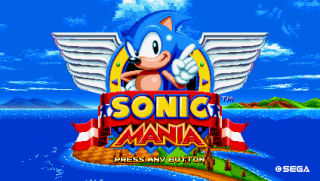 A definitive version of the game, aptly titled Sonic Mania Plus, was released on July 17, 2018 as paid downloadable content to the base game alongside a physical version of the game. This version includes the return of Mighty the Armadillo and Ray the Flying Squirrel as playable characters, as well as a 4-player Competition Mode and Encore Mode. 7.2 Sega of America, Inc.
7.5 Sega Games Co., Ltd. Some time after saving Angel Island, Sonic the Hedgehog and his best friend, Miles "Tails" Prower, are relaxing when Tails picks up a strange energy reading far away. Though different from the Chaos Emeralds, the reading is remarkably powerful, and Tails convinces Sonic to join him and check it out. Sonic and Tails take off on the Tornado towards the source, but sure enough, the evil Dr. Eggman has detected it too! Now it's a race between Sonic and Eggman to get there first and figure out what mysteries it holds. However, Eggman has been busy: he's just unleashed a new team of elite Egg-Robos to handle his most important tasks. They're called the "Hard-Boiled Heavies," and they're about to reach the source of the signal first! It's up to Sonic, Tails, and their newest ally, Knuckles the Echidna, to defeat the Hard-Boiled Heavies, unlock the secrets of the energy source, and stop Dr. Eggman! The world's fastest hedgehog! Although often impatient, Sonic has a heart of gold and a strong desire to fight injustice - which means putting a stop to the evil Dr. Eggman's plans. His blistering speed, Super Sonic Spin Attack, and sassy attitude make him a force to be reckoned with. After reconciling his differences with Knuckles, he's enjoyed some peace and quiet with Tails and their animal friends - until now. Miles "Tails" Prower grew up idolizing Sonic, and now joins him on his adventures. He can fly using his two tails, and as a skilled inventor and mechanic, his talents almost rival those of Dr. Eggman. Anywhere Sonic goes, Tails is never far behind. An evil genius with an IQ of 300, Dr. Eggman won't stop until he dominates the world with his army of mechanized minions. Despite suffering defeats at the hands of Sonic and his friends, Dr. Eggman's confidence never wavers. Intrigued by this new energy signal, he plans to exploit it for his own means. With something this powerful, he could finally stop Sonic forever. Sonic and "Tails" in the first act of Studiopolis, one of the original zones from the game. As a continuation of the gameplay design of the original Mega Drive and Genesis games, Sonic Mania's gameplay is relatively identical to those games and familiar to well-versed fans of the original titles. Players are still expected to clear the level under the span of ten minutes, with all of the classic elements present--collecting rings to protect themselves from taking damage, running/rolling through loop-de-loops to gain speed, using springs to reach higher platforms, and avoiding badniks and spikes that can cause damage, as well as other dangerous traps and gimmicks along the way. Item boxes are also present, with standard powerups like speed shoes, invincibility, and the ten-ring box present; as well as starposts that save the player's spot in the level. The game design also follows from Sonic the Hedgehog 3 and Sonic & Knuckles in particular, resulting in many elements returning from those games as well. Sonic the Hedgehog, Miles "Tails" Prower, and Knuckles the Echidna all return as individual playable characters, as well as a mode that allows "Tails" to follow Sonic and provide local cooperative play between two players (with Player 1 controlling Sonic and Player 2 controlling "Tails"). All three characters retain the standard spin attack and spin dash abilities; with "Tails" also having his flying and swimming mechanics, and Knuckles having his climbing and gliding mechanics as well. The game's Zones are separated into two relatively large Acts, packed with multiple routes and secret locations for players to discover; alternate routes only accessible by certain characters are also present as well. Every Act also ends with one boss fight, with "sub-bosses" featured at the end of Act 1; and standard bosses featured at the end of Act 2. Shields also return in this game, with the titular trio of elemental shields from Sonic 3 (the Water Shield, Fire Shield, and the Lightning Shield) restored, alongside the the standard shield as seen from Sonic 1, Sonic 2, and Sonic CD. Knuckles in the second act of Chemical Plant, one of the game's zones returning from the Mega Drive-era Sonic games. The game is not without new additions and notable changes to the formula, however. The W Spin Attack introduced in Sonic 3 (popularly known as the "insta-shield") is absent from Sonic's moveset (although it is unlockable); having been replaced with the new "Drop Dash" ability. Best summarized as a "mid-air spin dash", the Drop Dash allows Sonic to build up momentum in mid-air after a jump, which upon contact on the ground grants the player additional speed and rolling distance. Environmental properties have also been granted to the elemental shields, which allow them to have additional properties to the levels--two notable examples are the Fire Shield burning down bridges in Green Hill and the Lightning Shield having magnetic properties in Flying Battery. A new item based on the Combine Ring from the obscure 32X spin-off Chaotix is also added (with its monitor appearance marked by a blue ring), which fuses the player's total ring count into multiple rings (a HUD indication is also marked by a blue ring icon added to the player's ring count). Should the player take damage, a handful of giant rings, which represent the total rings lost, fly out of the character; these rings of which can be recollected for a brief period of time. Returning to Sonic Mania are Special Stages, which by tradition contain the series' treasured Chaos Emeralds. As in Sonic 3, Special Stages are hidden within the stages and are accessible through Giant Rings. A new concept based on the Special Stages as seen in Sonic CD and Chaotix; the Special Stages see the player chasing down a UFO carrying a Chaos Emerald in a three-dimensional course, while also making sure to stay on the track (as the player can fall off the course into a pit) and avoid hazards such as spiked balls. Racing against a time limit, the player has to catch up to the UFO in order to earn the Chaos Emerald before the time limit expires. Spread out inside the level are spheres which can increase their speed (collecting a certain number of spheres increases the "Mach" speed level of the player's character), as well as rings that can increase the game's time limit. Also returning in Sonic Mania are the Bonus Stages as presented in Sonic 3 and Sonic & Knuckles, which are accessible through a circles of stars that appear above Star Posts, should they be activated with at the player holding at least 25 rings. This time, the Bonus Stage see the return of the Blue Spheres stages from the aforementioned two games, with the primary change being the player collecting one of two types of medallions upon completion of the stage. The player is awarded a Silver Medallion upon collecting all of the spheres, while the player collecting all of the spheres and all of the rings (and thus earning a "Perfect" score) is awarded a Gold Medallion. The Bonus Stages are randomly selected, and Blue Sphere layouts for the stages include reused layouts from Sonic 3 and Sonic & Knuckles, as well as original layouts. Sonic and Tails in Green Hill, within the two-player Competition Mode. Sonic Mania also features a Time Attack mode, as first seen from Sonic CD. This time, the Time Attack mode features unique goalposts separate from the main campaign (both used for starting and ending the level), as well as a new feature that allows players to immediately restart the level during playthroughs by pressing and holding a certain button. Acts in Time Attack mode exclude bosses and checkpoints, and the clock functions as as a timer. Players upon completing Acts are graded on their time, and their score; an a additional "Cool Bonus" is added if the player completed the level without taking damage. Once Acts are completed, the game saves and records your time, in which the player can either compare them to a personal list of best time logs, or upload their record to an online leaderboard. A Competition mode that provides competitive multiplayer with two players is also included. Adapting the two-player "Vs. Mode" setup as seen in Sonic 2, players see themselves racing each other in zones from the main campaign in a split-screen format, and are graded on a criteria of the player's Score, Time, Ring count at the end of the act, their Total Ring count (including rings they lost), and the amount of Item Boxes broken. The player that wins the most criteria takes the round. Unlockable Blue Sphere and Mean Bean Machine bonus mini games are playable after getting medallions from the Bonus Stage. Nintendo Switch Nintendo Everything #11 Best-selling Nintendo Switch game Due to the distribution of the source, Nintendo Everything presumes this list of best-selling Switch games only counts eShop sales in the Americas.
" Nintendo.co.jp (Domestic/Japan, Overseas), Nintendo Everything #22 Most-downloaded Nintendo Switch eShop game in Japan, #3 Most-downloaded Nintendo Switch eShop game overseas Nintendo Everything source notes that both lists only count games exclusively released on the eShop, and the Overseas list only counts games released worldwide. Tails from the E3 poster. This page was last edited on 5 January 2019, at 19:46.